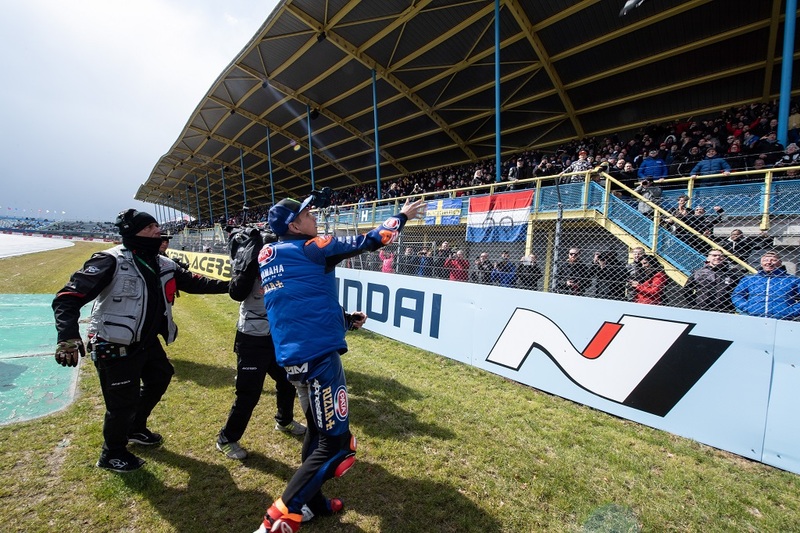 Pata Yamaha’s Michael van der Mark had lined up on the front row of the grid for Race 1 at Assen this afternoon, having qualified second in a red flagged Superpole session earlier in the day, when snow forced the riders back to their pit boxes and the start to be delayed. With Assen currently experiencing unseasonably cold conditions and with intermittent snow continuing to cause disruptions, the race was eventually postponed until tomorrow. Instead of the usual sprint race and feature race tomorrow, the WorldSBK riders will contest two full length, 21-lap races, with the first getting underway at 11.00 and the second at the originally scheduled time of 14.00. It was disappointing for van der Mark, who was looking forward to entertaining the Dutch fans in today’s race, after an impressive qualifying performance. The Pata Yamaha rider occupied the top spot on the timesheet for most of the Superpole session, only relinquishing it as the session drew to a close. Van der Mark was all set to reclaim pole position with his final qualifying run but missed out when the session was red flagged following a crash for Toprak Razgatlioglu with just over a minute left to run.